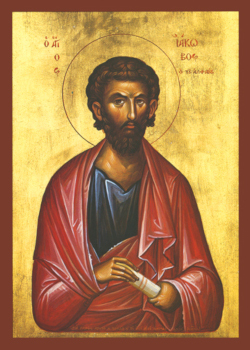 Saint James Alphaeus – one of the Twelve Apostles – was brother of the holy Evangelist Matthew. After the Descent of the Holy Spirit, the Apostle James Alphaeus, together with the Apostle Andrew the First-Called, made missionary journeys preaching in Judea, Edessa, Gaza, Eleutheropolis, converting many on the path of salvation. In the Egyptian city of Ostrazin Saint James finished his apostolic work with a martyr’s death on a cross.